I'm not sure why this particular combination of vegetables (with pasta) tastes so delicious, but I think it's something about the mixture of fennel and eggplant. Or maybe it's just everything, including the peppers, garlic, and zucchini. Whatever the explanation, I love this dish, and the feedback I've gotten from readers has been uniformly positive. 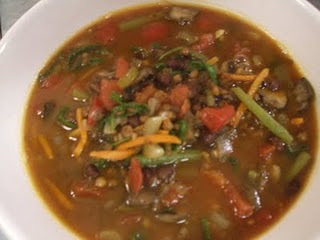 Try this easy and very satisfying vegetarian soup! It's loaded with fiber, vitamins and minerals -- not to mention, it soothes the throat and warms your innards. Heat the oil in a large pot over medium heat. Add onions, celery and carrots. Cook for 3-4 minutes, stirring frequently, until veggies soften and start to brown a little. Add mushrooms and garlic and cook another 3-4 minutes, stirring often. Add remaining ingredients except spinach or aruglula and stir well. Cover and bring the soup to a low boil, then remove cover and cook until the green beans are tender, about 10 minutes. 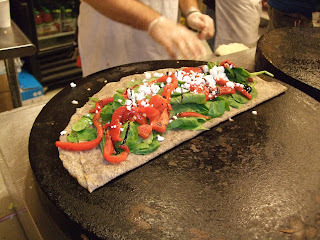 Stir in greens (arugula or spinach) and cook another 1-2 minutes, just until greens wilt. Serve immediately. Serve with crackers, hearty whole-grain bread or brown rice. 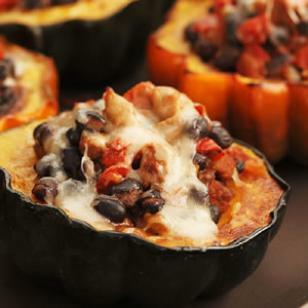 Acorn squash, that is. It's got a southwestern tang thanks to chili and jack cheese, and extra spice with the addition of turkey sausage. 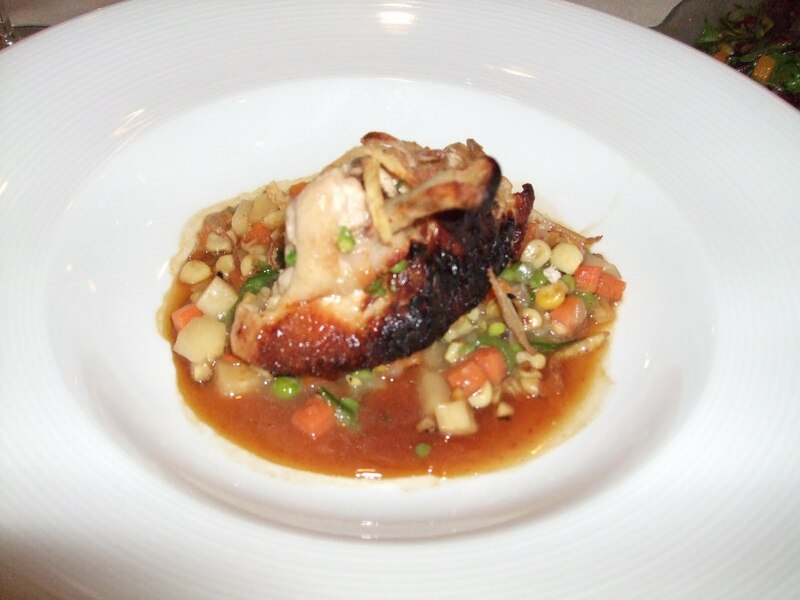 Even picky eaters ought to love this dinner entree! Cut squash in half horizontally. Scoop out and discard seeds. Place the squash cut-side down on the prepared baking sheet. Bake until tender, about 30 minutes. Meanwhile, lightly coat a large skillet with cooking spray; heat over medium heat. Add sausage and cook, stirring and breaking up with a wooden spoon, until lightly browned, 3 to 5 minutes. Add onion and bell pepper; cook, stirring often, until softened, 3 to 5 minutes. Stir in garlic, chili powder and cumin; cook for 30 seconds. Stir in tomatoes, beans, salt and hot sauce, scraping up any browned bits. 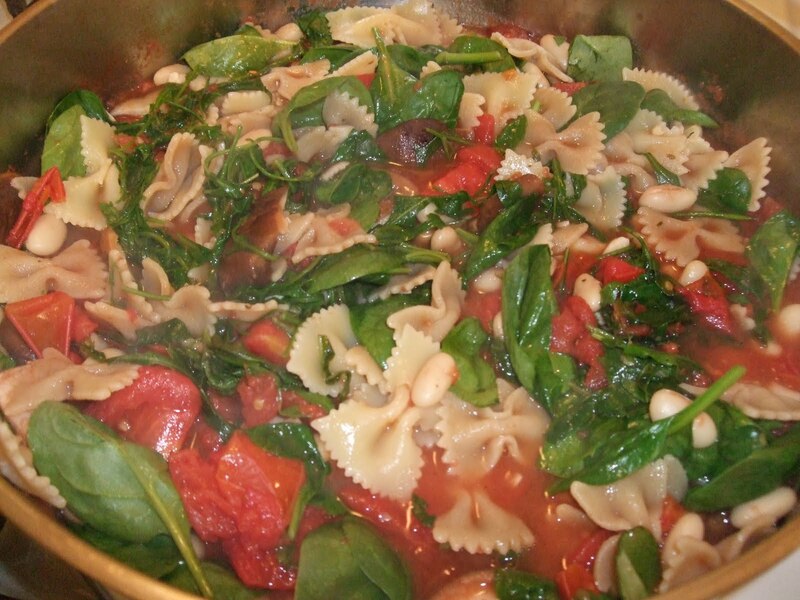 Cover, reduce heat, and simmer until the tomatoes are broken down, 10 to 12 minutes. When the squash are tender, remove them from the oven and reduce oven temperature to 325°. Fill the squash halves with the turkey mixture. Top with cheese. 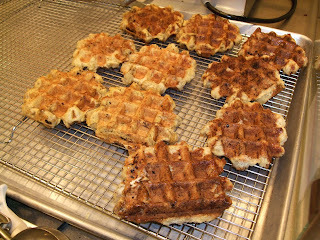 Place on the baking sheet and bake until the filling is heated through and the cheese is melted, 8 to 10 minutes. We've done beef stew, cupcakes and a couple of other comfort-food standbys. 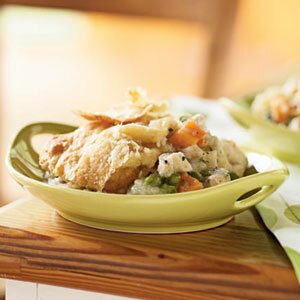 How about that old fave, chicken pot pie? In this recipe, you can use all those different root veggies or substitute the same overall amount with ones you have on hand, or whose taste you may prefer. Bring broth to a boil in a large Dutch oven. Add peas and next 5 ingredients (through onions) to pan; cover, reduce heat, and simmer for 6 minutes. Add chicken; cook for 5 minutes or until chicken is done. Remove chicken and vegetables from broth with a slotted spoon; place in a large bowl. Increase heat to medium. Lightly spoon flour into dry measuring cups; level with a knife. Place all but 1 tablespoon flour in a medium bowl; gradually add milk to bowl, stirring with a whisk until well blended. Add milk mixture to broth; cook for 5 minutes or until thickened, stirring frequently. Stir in chicken mixture, parsley, thyme, salt, and pepper. Spoon mixture into an 11 x 7-inch baking dish coated with cooking spray. Sprinkle remaining 1 tablespoon flour on a work surface; roll dough into a 13 x 9-inch rectangle. Place dough over chicken mixture, pressing to seal at edges of dish. Cut small slits into dough to allow steam to escape; coat dough lightly with cooking spray. Place dish on a foil-lined baking sheet. Bake at 400° for 16 minutes or until pastry is browned and filling is bubbly. From one of my favorite healthy-foodie magazines, a new cookbook. Click on the photo for a link to more info. Our biggest book ever: 512 pages! 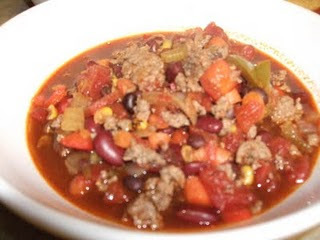 Shorter days, longer nights, cooler temperatures: time for soups, stews and chilies. This chili uses healthful bison/buffalo meat -- much less fat and saturated fat than beef, and you really can't tell the difference in this preparation. Lots of veggies and two kinds of beans makes it a nutritional powerhouse. The addition of a bottle of dark beer gives a depth of flavor you'll love. Have more of the same beer with the finished product, if you like. Serve over rice, with corn chips or (my favorite) cornbread. Pass a bowl of grated jack or cheddar cheese at table, if you want. You can freeze any leftovers and have it again on a cold November night. Yes, you can still find fresh (not dried) figs in stores such as Whole Foods and at specialty markets, including Madison's at Findlay Market. Fresh figs are a great treat and worth seeking out. Most people eat them cold/raw, but I love to add them to cooked savory foods. Their sugars become caramelized and the smooth texture of cooked figs is delightful. For this supper, I sauteed turkey breast cutlets and added leeks and garlic along with the figs. There are just a few ingredients, making this a quick and easy meal. 2. Reduce heat to medium. 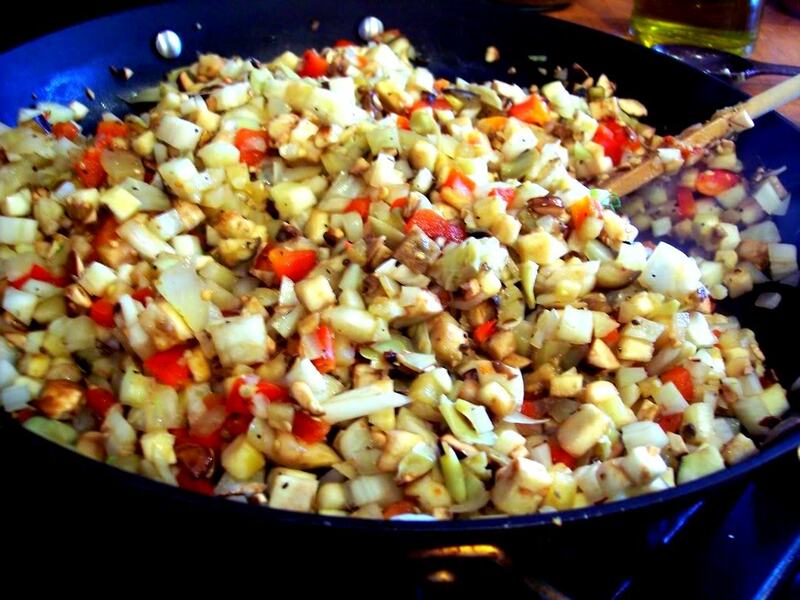 Stir in leeks and garlic and stir-fry for just a minute to let the veggies start to cook. Add broth/stock, cover the pan and cook for about 3-4 minutes. 3. Add figs, stir well, and cover the pan again. 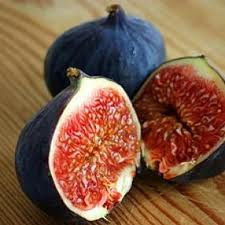 You only need to let the figs heat through and become soft, perhaps another 3 mimutes. 4. Adjust seasonings, adding more salt and pepper if desired, and serve. (Served with Brussels sprouts in the photo. Whether you're cooking for a crowd or bringing a dish to someone else's house, finding great Thanksgiving recipes is no easy task. 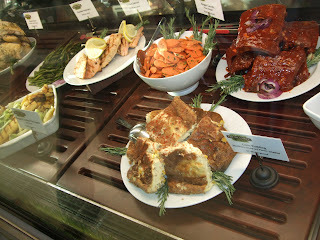 But my goal for TG dinner is not really different from how I try to eat all the time: make it yummy and healthy, too. The big difference, of course, is that on Thanksgiving we're going to eat way more than usual. I think that makes it more important than ever to apply healthy-foodie principles (tasty AND healthful) to what we cook and serve on that 4,000-calorie day. In other words, I try to keep it to maybe 2,500 hundred cals -- ha, ha. 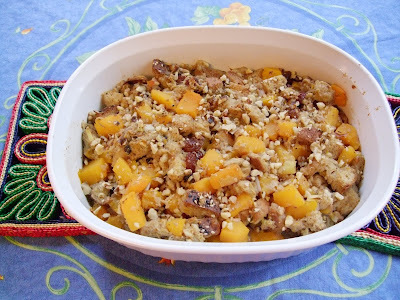 I made this delicious stuffing/dressing last holiday season and it was a huge hit among all who tried it. New fave! 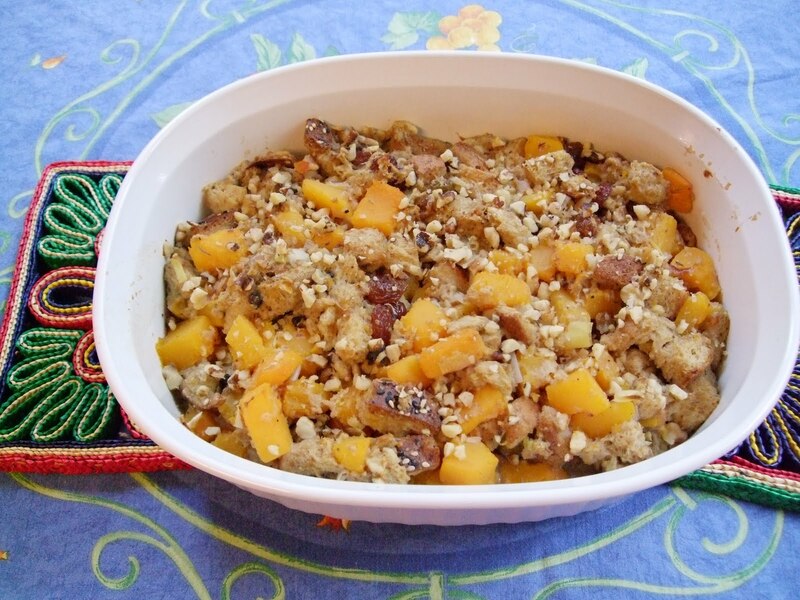 The butternut squash adds a toothsome texture (just be sure not to cook it too much before adding to the other ingredients), a pretty color, as well as vitamins, beta carotene and fiber to a traditional bread stuffing or dressing. (Southerners tend to call it dressing because you don't "stuff" it into the bird.) Dried fruit and chopped nuts make it even tastier. This side dish for your holiday feast will also make a nifty main course for a vegetarian TG, should you be so inclined--or should there be a vegetarian or two on your guest list who will pass on turkey. Chocolate Festival this weekend -- yesssss! On Sunday, October 24th, I'll be checking out the Cincinnati Chocolate Festival on Ridge Avenue, just south of Cross County/Ronald Reagan Highway in Pleasant Ridge. It runs from 12-5, costs only $5 admission, and promises more than 25 vendors, cooking demos, contests and raffles, and more. 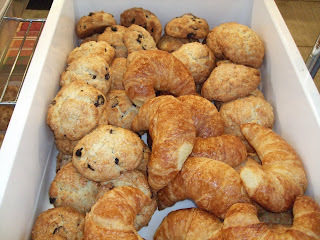 The "more" of course means amazing treats to sample along with a plethora of gift items for the holidays. Donna's Gourmet Cookies will be there -- a personal favorite -- along with candy makers, cupcake bakers and more goodies than a person can imagine. I'll be saving a few calories to "spend" on Sunday! These brilliant bottles are terrific deals! Argentinean malbec tends to be cheap, and undistinguished. This one is super-cheap, and lovely.. It's a rarity to find a wine made in such quantity (500,000 cases) that has this much character. Pinot grigio is not a wine I care for, but this one is supposed to be more like a good pinot gris (which I do tend to like). Chile's coastal vineyards produce terrific bargain sauvignon blancs..
Chenin blanc is one of the world's most underrated white grapes. Decent pinot at these prices? Amazing! Spain's Jumilla region produces powerful reds from the Monastrell grape. This one's a knockout. I’ve always liked this wine, and it’s a great value for the quality. Very food-friendly. A few more dollars than the Castle Rock, but 2008 was such a great vintage in Oregon, so it’s worth it. This is easy, healthy and quite delicious. Cook the pasta according to package directions until al dente; drain and set aside. Heat oil in a large skillet over medium heat. Add mushrooms and garlic and stir-fry for 3 minutes. Stir in tomatoes, water, salt, pepper and oregano. Cover pan and let mixture heat through, about 3-4 minutes. Stir in beans and greens (spinach and/or arugula); cover pan again and let heat just until the greens begin to wilt, about 3 minutes. Add pasta to pan and stir well. Spoon into bowls for serving, passing the cheese at table. TOP PHOTO: How it should look when all ingredients are in. BOTTOM PHOTO: A bowl ready to eat, with cheese. 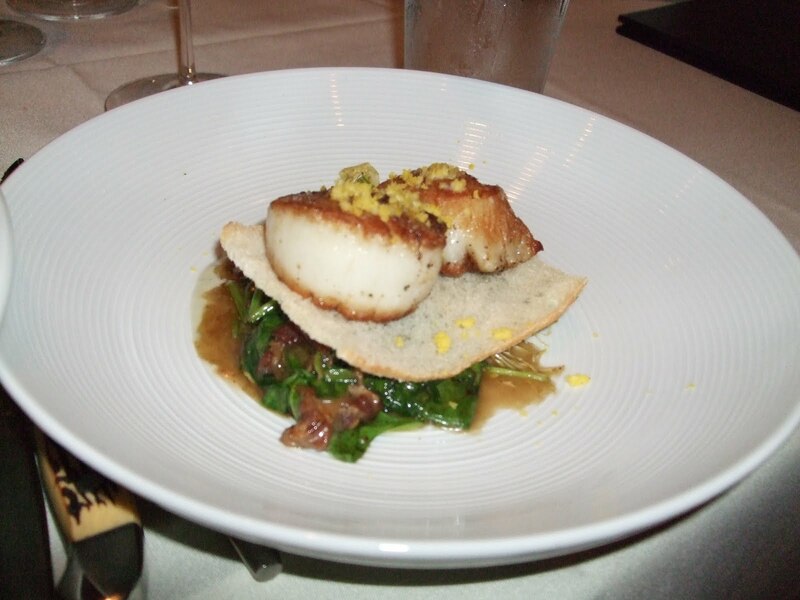 Serve with a fruity red wine, such as zinfandel or shiraz -- or any wine that you like. Crusty whole-grain bread goes nicely with it, as well. 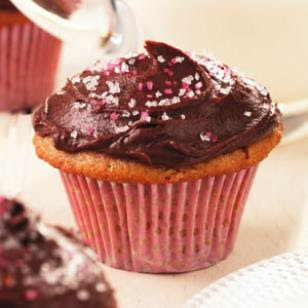 Here are a couple of recipes that sneak in a few healthful substitute-ingredients to make adorable, scrumptious cupcakes less of a guilt pleasure. Instead of food dye in the pink frosting, for instance, a little raspberry puree gives it a lovely color. 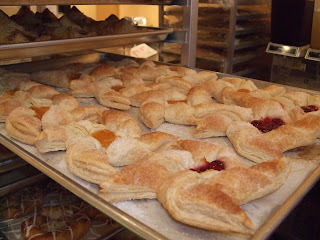 Whole wheat flour also is "disguised" with more raspberry puree in the cake dough. The vanilla cupcakes substitute applesauce for butter, and use evaporated milk in the frosting. To prepare cupcakes: Preheat oven to 350°F. Line 12 (1/2-cup) muffin cups with paper liners. Whisk whole-wheat flour, cake flour, baking soda and 1/2 teaspoon salt in a medium bowl. Beat granulated sugar and oil in a large mixing bowl with an electric mixer on medium speed until combined. Scrape the black paste out of the vanilla bean into the sugar mixture. Add applesauce, egg, egg yolk and vanilla extract and beat until well combined. With the mixer on low, alternately mix in the dry ingredients and 1/2 cup evaporated milk, starting and ending with dry ingredients and scraping the sides of the bowl as needed, until just combined. Divide the batter among the prepared cups (they will be full). 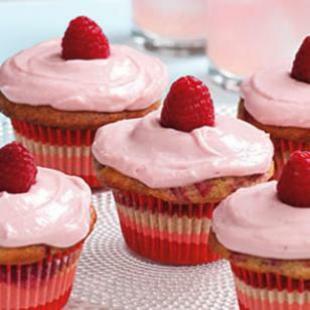 Bake the cupcakes until a toothpick inserted into the center comes out clean, 20 to 22 minutes. Transfer to a wire rack and let cool completely. To prepare frosting: Meanwhile, whisk 2/3 cup of the remaining evaporated milk, all-purpose flour and a pinch of salt in a small saucepan until no flour lumps remain. Cook over medium heat, whisking constantly, until it looks like a thick, stiff paste, 2 to 5 minutes. Remove from the heat and continue whisking for about 30 seconds to cool slightly. Whisk in chocolate until completely melted. Transfer to a medium bowl. Add confectioners’ sugar, cocoa and vanilla and beat with an electric mixer until smooth and creamy. Refrigerate the frosting until thickened and cold, about 2 hours. Spread the frosting on the cooled cupcakes and decorate with sprinkles, if desired. 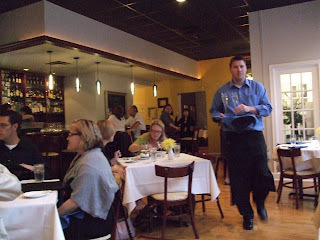 La Poste, First Impressions: "A"
My friend and I had dinner Tuesday at Clifton's new restaurant, La Poste, on Telford Street around the corner from the Esquire Theater in the space that housed Tink's for many years. What an upgrade from Tink's, and what a great thing for my 'hood. This will not only be a top-notch neighborhood restaurant, it also will become destination dining for the rest of the metro area. At least, that's what I think based on one evening of wining and dining. More good stuff: you can order by the half-glass for half the price of a full glass and try more wines. As you can see from the top photo, we sampled several wines and I look forward to getting back there soon to try more. Bryant is a true wine geek in the best sense, and he seems to have visited every obscure European or American vineyard whose unusual wines he's selected for the list. The glassware was excellent and the whole wine experience is several notches above anything in town except perhaps the most expensive fine-dining establishments, and even there I am hard pressed to think of anything as good as what Bryant and the rest of the staff have put together. Everything else about our evening was equally wonderful, except perhaps that the kitchen was a little slow in getting our food out. A minor point though when all else was near perfect. The space is the same as Tink's in size, with the addition of an extra dining room and wine storage where a jewelry store used to be....but the feel is much, much more elegant without being at all stuffy. I ordered a seasonal salad with tiny chunks of butternut squash (third photo), and then we split the chicken fricassee entree -- the photo above is of half the dish. We passed on dessert and stopped at Graeter's nearby for a cookie instead. 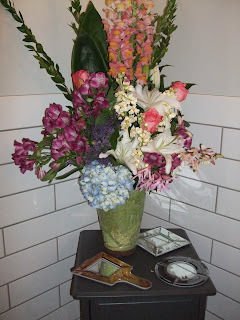 The floral arrangements around the place were glorious, and I had to include a couple of photos of them, including the amazingly fragrant bouquet in the lovely ladies' room. I'm a huge fan of breakfast, and it's almost always my healthiest meal of the day. New evidence supports the idea that eating the right sorts of things at the start of your day can rev up your body to be a fat-burning machine for hours afterward. A key to getting those benefits is to work in a brisk walk or other exercise around lunchtime. According to Eating Well Magazine, "eating a breakfast made with “slow-release” carbohydrates, such as oatmeal or bran cereal, three hours before you exercise may help you burn more fat, suggests a recent study in the Journal of Nutrition. Here’s why: in the study eating “slow-release” carbohydrates didn’t spike blood sugar as high as eating refined carbohydrates, such as white toast. In turn, insulin levels didn’t spike as high and because insulin plays a role in signaling your body to store fat, having lower levels may help you burn fat." Here's a recipe that has all the right stuff. Make a batch tonight -- or whenever you have all the ingredients on hand and time to do so -- and have it around for several breakfasts to come. 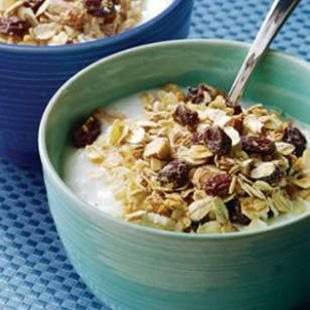 Serve this Scandinavian cereal with low-fat yogurt or nonfat milk to start your day off with whole grains and some protein and calcium-rich dairy. You can substitute any combination of chopped dried or fresh fruit for the raisins—apricots, apples, figs, cherries or cranberries would all be delicious. Try walnuts or hazelnuts instead of the almonds if you like. Ground flaxseeds stirred in at the end provide a boost of heart-healthy omega-3s. 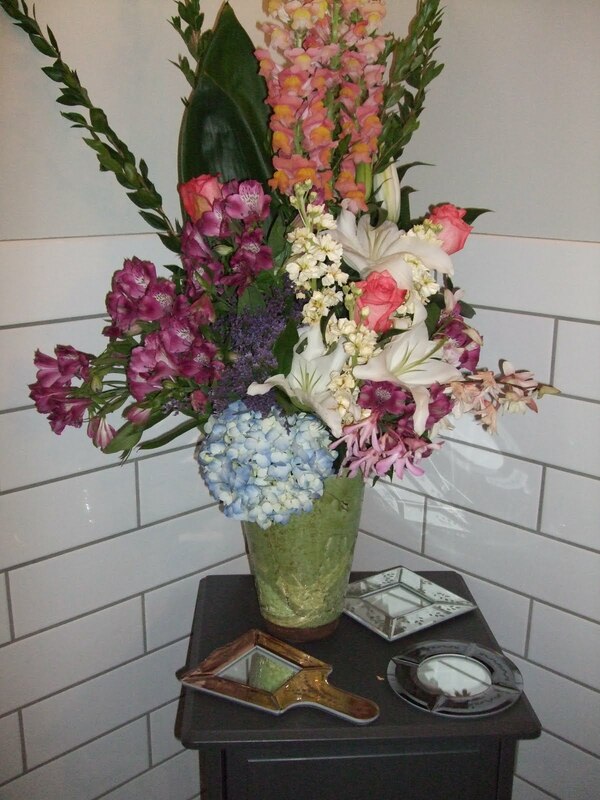 Can be stored in an airtight container for up to 2 weeks. Preheat oven to 350°F. Coat a baking sheet with cooking spray. Spread oats and rye (or wheat) flakes on the baking sheet. Bake for 10 minutes. Stir in almonds and coconut; bake until the oats are fragrant, about 8 minutes. Turn off the oven. Stir raisins into the muesli. Microwave honey for 10 seconds in a glass measuring cup. Stir in vanilla and cinnamon; drizzle over the muesli and stir to coat. Return the muesli to the turned-off warm oven and let cool completely, about 2 hours. Stir in flaxseeds, if using. 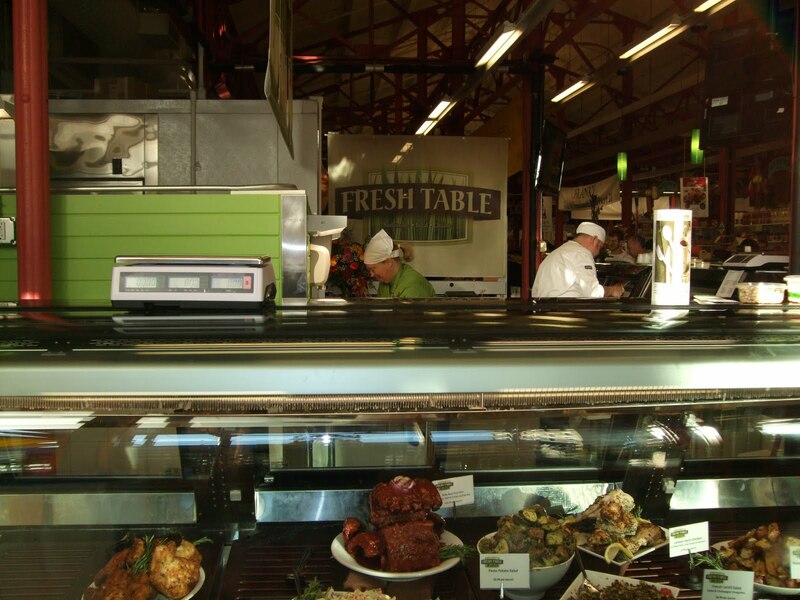 Just opened this weekend: Fresh Table, a chef-owned gourmet-to-go business inside Findlay Market. 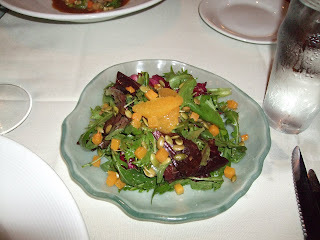 I tried several dishes, which graced our table on Saturday night, and everything was delicious. We loved the panko-crusted boneless chicken breast, which I reheated in a warm oven for about 10 minutes -- it was like having fried chicken without the guilt. My kind of entree! Not as guiltless but at least as yummy was the savory bread pudding, with ingredients that included leeks (a magic ingredient in my book) and a touch of cream. It was so tasty, I think we might have to get some for a holiday dinner for company! Fresh Table also had some vegan offerings, including mashed potatoes made with soy cream and soy butter, and macaroons. 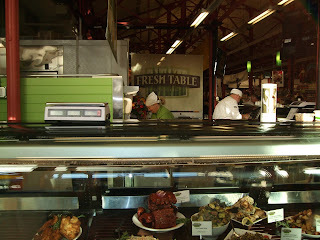 For the past couple of months I've been having breakfast at Findlay Market on Saturdays. Instead of my usual super-healthy home breakfast of oatmeal, cold cereal or whole wheat toast -- always with plenty of fruit and a pot of loose-leaf black tea, I bring some fruit with me and head to the market after an early morning exercise walk. 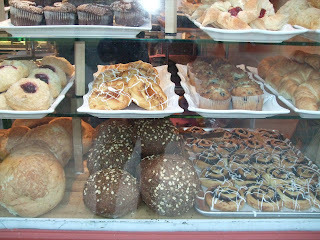 I buy coffee from either the Bean Haus or Skirtz & Johnston, and then select a breakfast pastry treat from among many wonderful choices. Here are photos of some of those possibilities. The crepes from Taste of Belgium (bottom photo) might be the healthiest choice, but I might also go for one of the scones, croissants or Danish pastries offered by the other vendors. It's quite a treat and a break from the ordinary! Here's how to make a healthier version of a delicious like-mom-made standby. 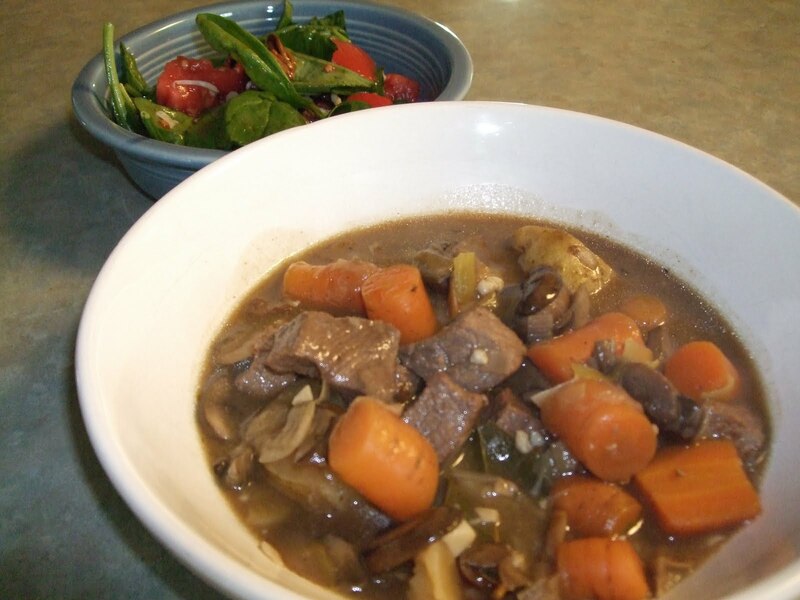 Use a small amount of high quality beef, add lots of flavorful veggies in addition to the standard carrots and taters, season creatively, throw in a bit of hearty red wine with the beef stock/broth and voila! Comfort food without the guilt. The veggies that make the difference are leeks and dried porcini mushrooms (with their soaking liquid). Buy grass fed or Angus stew beef if you can get it. Wine that works includes zinfandel, carbernet sauvignon or (what I had on hand) shiraz/syrah. 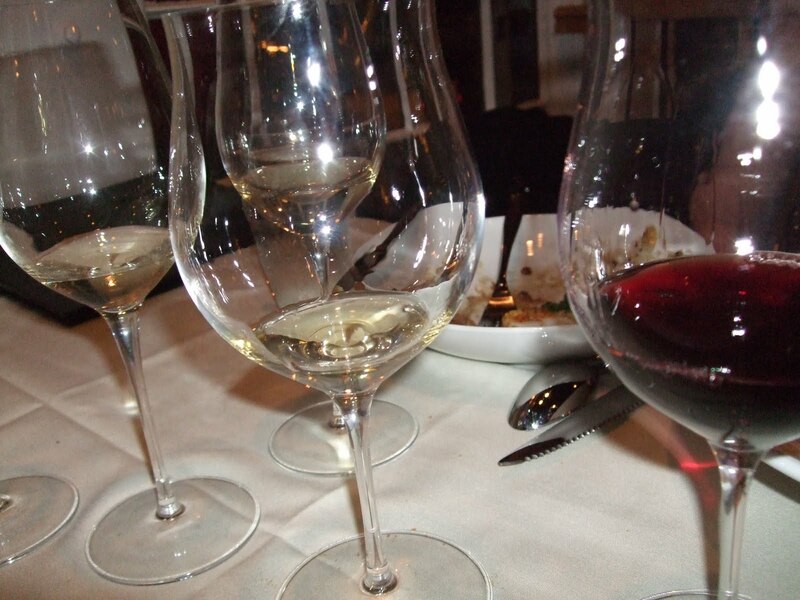 Serve the same wine at table along with a green salad and some crusty (preferably whole grain) bread. Heat oil in your largest saucepan or a Dutch oven over medium high heat. When oil begins to sizzle, add beef and cook, stirring, until beef begins to brown. Remove with a slotted spoon to a plate or bowl and keep nearby. Add leeks and garlic to pot, stirring for 1-2 minutes until they begin to soften. Stir in remaining vegetables (potatoes through porcini mushrooms) and cook, stirring occasionally, until all the vegetables begin to heat up and start to cook, about 3-4 minutes. Sprinkle flour over the veggies, stir well, and cook for another 2 minutes. Return beef to the pot. Add liquids (mushroom soaking liquid, wine and stock/broth), stirring well. Cover the pot and bring the mixture to a low boil. Remove cover, reduce heat to medium and add thyme, salt, pepper and the bay leaves. Cook for another 30 minutes or until carrots and potatoes are your desired level of tenderness by testing with the point of a knife. Even though summer produce is (sadly) going, going and gone, certain really healthy and yummy crops are heading into their own peak season. I'm thinking today about greens of all kinds, including kale, broccoli and spinach. While they may not have as many fans as do tomatoes or corn, these sometimes-bitter greens could not be healthier -- and CAN be made to taste amazingly delicious. "Numerous scientific studies indicate that eating cruciferous vegetables—including kale, Brussels sprouts, broccoli, and collard greens— can block carcinogens. Leafy greens such as spinach and Swiss chard are vitamin-rich and brimming with phytonutrients, including flavonoids and carotenoids, that are linked to a host of health benefits. 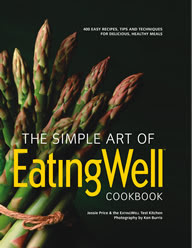 "Researchers have identified at least 13 different flavonoid compounds in spinach that function as antioxidants and as anticancer agents," George Mateljan writes in his book The World's Healthiest Food. Mateljan cites research suggesting that spinach can fight against breast, skin, stomach, and prostate cancers." 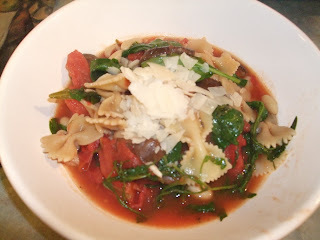 Over the next few weeks, I'll post occasional recipes based on spinach, kale and other cruciferous veggies. Here's hoping you'll enjoy some of them! Cut tofu into eight 1/2-inch-thick slices. Arrange on paper towels; drain 10 minutes. Spread both sides of each slice with mustard. Heat 2 tablespoons oil in large nonstick skillet over medium-high heat. Add onion and ginger; sauté 1 minute. Add kale, sweet potato, and lime juice. Cover, reduce heat to low, and cook until potato is tender and kale is wilted, about 12 minutes. Meanwhile, heat remaining 2 tablespoons oil in another large nonstick skillet over medium heat. Add tofu; cover and cook until heated through and crisp, about 2 minutes per side (some mustard seeds may fall off tofu). 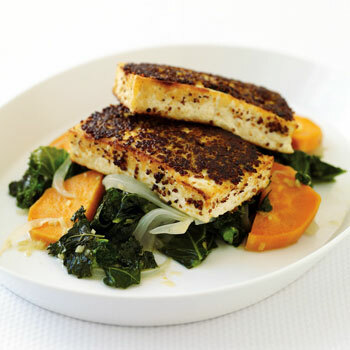 Arrange kale and sweet potato mixture on plate. Overlap tofu slices atop vegetables and serve. These bottles definitely take us out of the everyday wine experience, at least for my budget. And while some are not too pricey -- the zin for $32 or the sauvignon blanc for $30 -- others I am sure will never pass my lips. Nonetheless, as a companion posting to my Best American Wines Under $20 (below), it seems appropriate to give the complete picture of these 2010 Food & Wine awards. Unlike the earlier, less expensive list, if you want to try any of the higher-priced winners, you'll probably have to shop online or in a very well stocked store. One of California's surest hands with pinot noir, Edwards also makes this perfumed, arresting Sauvignon. 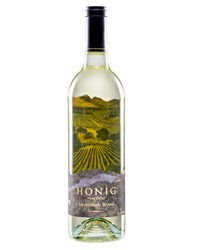 Assembled from several Russian River Valley vineyards—some planted to the aromatic Musqué clone—the wine combines tangerine and peach with Musqué's hard-to-define, not-quite-honeysuckle aroma. One of California's first post-Prohibition chardonnay producers, Sonoma's Hanzell has long gone its own way, preferring an Old World sense of proportion over showy richness. That balance is epitomized in its long-aging Chardonnays, like this creamy, floral bottling from talented winemaker Michael McNeill. This all-Chardonnay bottling was the Davies family's original sparkler back in 1965; Richard Nixon served it on his 1972 trip to China. For the 2006 vintage, the wine was aged in the bottle for two years on its lees (spent yeasts), giving complexity to its flavors of yellow apple, pear and melon. There are easier places to grow grapes than this steep, ocean-cooled vineyard in Santa Barbara County, but Steve Clifton (also of Palmina) and Greg Brewer (Melville) started farming it themselves in 2004 anyway. Their 2008, an opulent Pinot with floral berry notes, makes it clear their work was worth it. In the excellent 2007 Washington vintage, Swiss-born winemaker Jean-François Pellet produced this cellar-worthy Merlot by combining fruit from the winery's two estate vineyards in the Walla Walla Valley—Pepper Bridge and Seven Hills. Because it sells exclusively from the winery rather than stores, this small, family-run Sonoma operation isn't broadly known except to Zinfandel lovers. Winemaker Rashell Rafanelli-Fehlman holds to the family style here—bright, lifted and juicy. This wine, from the chilly 2006 vintage, suggests so. Bob Lindquist is one of the greatest interpreters of Syrah from the famed Bien Nacido Vineyard, and his winemaking shows the grape's full potential. Overseen by Chris Justin and consultant Celia Welch (F&W's Winemaker of the Year in 2008), Buccella has swiftly become a top Napa Cabernet producer. The great 2007 vintage played to Buccella's strengths, resulting in a cassis-inflected wine of extraordinary polish. Robert Mondavi's children Tim and Marcia have moved on after the sale of the family winery. Their Cab-Sauv–based, gorgeously fragrant red comes from Pritchard Hill and Oakville vineyards, two of Napa Valley's most sought-after Cabernet locations. Here's a list of affordable, delicious wines that recently won acclaim from Food & Wine magazine. I've tried and enjoyed several of them -- the Honig, the Elk Cove and the Columbia Crest, for instance, and will seek out the others. More good news: they should be widely available in almost any large metro area in the U.S.
Winemaker Kristin Belair innovates with different winemaking methods on different parcels of grapes, allowing her, for instance, to emphasize the grapefruity character of a specific lot. The Napa winery itself is innovative, too: All energy needed for production, cooling and bottling is solar-generated. In 2008, bad weather in California's Edna Valley drastically cut the amount of fruit from Wolff Vineyard but packed flavor into the grapes. Jeffrey Patterson makes this wine exactly the same way he makes Mount Eden's pricier estate Chardonnays, producing a white with vivid flavors of pear, peach and lime. Elk Cove benefited from the fine 2008 vintage in Oregon's Willamette Valley, where it's been producing top Pinot Noir and Pinot Gris since the 1970s. A cool summer and sunny fall meant ideal grapes, and winemaker Adam Campbell accented their brightness by fermenting this lemon-zesty wine in stainless steel tanks. This Oregon red offers the lively, aromatic appeal of Willamette Valley Pinot Noirs costing twice as much. An affordable secondary brand made by the Willamette Valley's Adelsheim Vineyard, one of the pioneering producers of Oregon Pinot Noir, this Wallace Brook shows the ripeness of the great 2008 vintage. This widely available Merlot comes from Washington's Horse Heaven Hills (hence H3), a promising region for complex, full-bodied reds. Its ripe blackberry fruit keeps some needed restraint thanks to the skill of winemaker Ray Einberger. Founder-winemaker Christian Tietje scoured vineyards from California's top Zinfandel counties—from Amador to Paso Robles—to assemble the fruit for this streamlined red. It's sumptuous in style, full of blackberry and blueberry fruit. Winemaker Carroll Kemp started Red Car back in 2000 in his Los Angeles driveway with two barrels of Syrah. 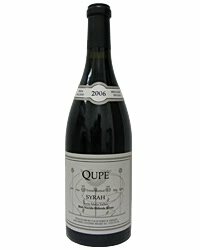 His output has grown since then, but Syrah remains the focus, as in this highly polished red's array of classic, cool-climate Syrah flavors: plum, dark berries and black pepper. Michael Martini's winemaking team used vineyards around the county for a straightforward red that also has considerable finesse. That deft touch isn't surprising, as Michael himself has been making wine for more than 30 years, and his family for more than 100. 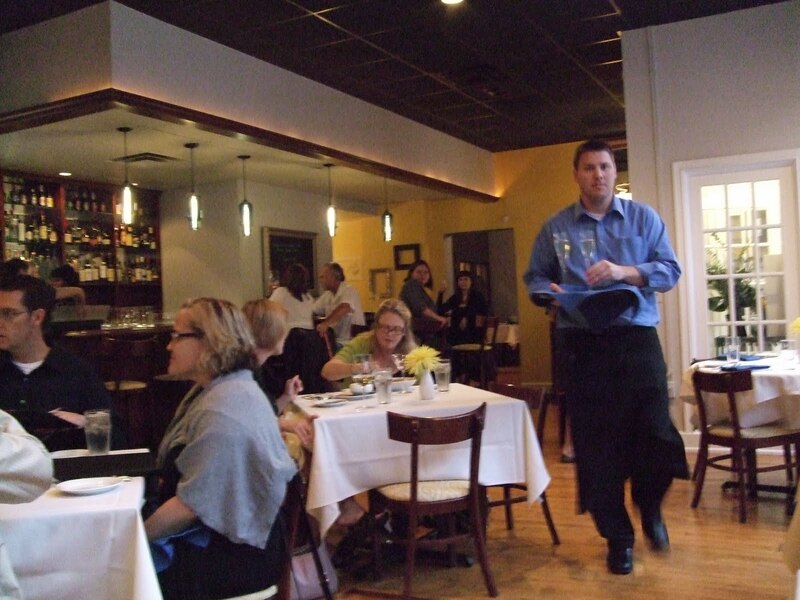 There's a new restaurant on Oakley Square called Sonoma American and Mediterranean Grill -- where Kona Bistro used to be. The owner is Israeli and added the "American" to his fare because he thought a lot of people wouldn't want to try the Greek/Middle Eastern dishes. But in their 10 days or so of business thus far, he says that 85% of the orders have been from the Med sections of the menu. My friend and I went for lunch on Friday. There weren't many other tables filled but with the disruptive road construction going on in that section of Oakley, it's no wonder. 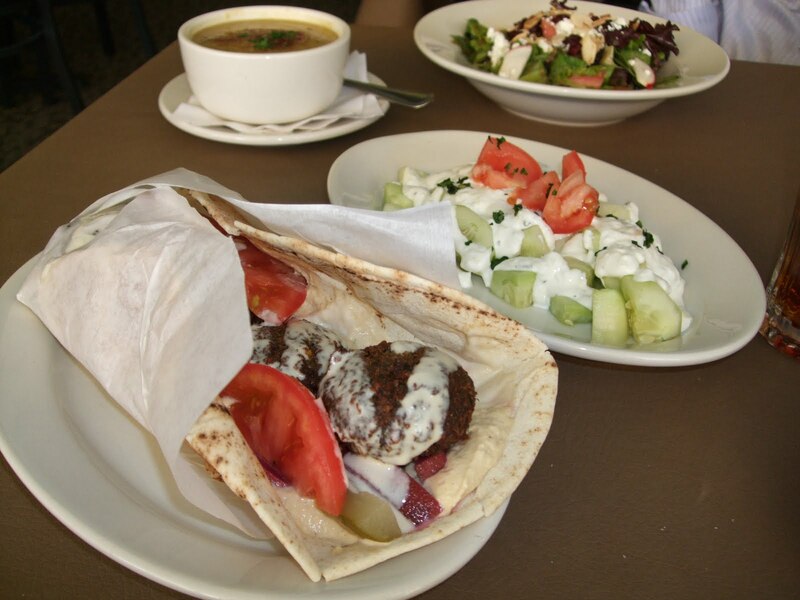 Susan ordered "the best lentil soup I've ever had" and a "scrumptious" house salad. She lives nearby and loves Mediterranean food, so I'm pretty sure she and her husband will be back. My falafel wrap was only OK.
Ryan (the owner) says the real house specialty is their kebobs, so that's definitely what I'd try upon returning. The type of cuisine definitely has a good health profile, and especially for the neighborhood, it should be a good option.